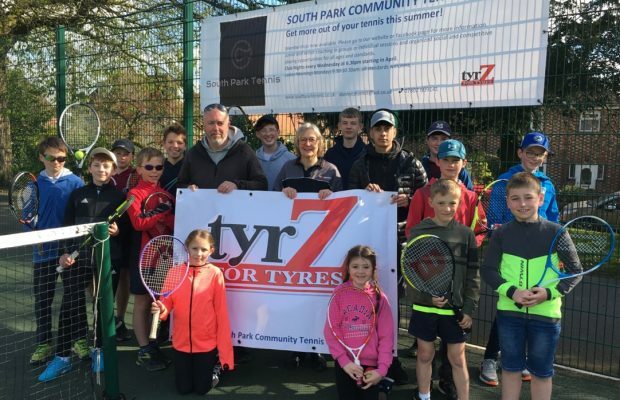 Bollington-based tyrZ for Tyres is celebrating a new partnership as it sponsors South Park Community Tennis Club. The family-run business has pledged to support the local club throughout the season with a generous donation, backing keen tennis players in Macclesfield. Following the opening of new sports facilities at South Park based on Park Vale Road, the South Park Community Tennis Club formed to provide an exciting and accessible way for players of all ages and standards to get involved in the sport. The club recently celebrated success when it captured a duo of trophies, firstly winning its division in the adult East Cheshire Winter League and the second as winners of the Under 18 Boys North West Point One Winter League. The monetary donation from tyrZ will assist the tennis club in offering first-class training to players and a chance for local residents to experience a club environment, without a large financial commitment. tyrZ is open Monday to Friday 8:30am – 5:30pm and Saturday 8:30am – 12:30pm. Located on Henshall Road, Bollington, tyrZ offers both a drive in and mobile service. Equipped with the latest state of the art Hunter Hawkeye Elite alignment system, as well as high end tyre fitting and wheel balancing equipment, tyrZ is able to cater for all vehicle types.